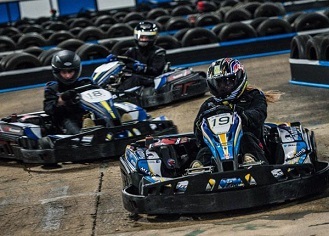 A huge amount of money has been spent on this state-of-the-art kart circuit located within the Essex town of Basildon. The 500m track is a multi-level affair and can take up to 16 karts at once - something quite novel for an indoor venue. A good range of events and great facilities make this a place to visit. From the M25, at Junction 29, take the A127 exit to Basildon/Southend. At the roundabout take the exit to merge on to Southend Arterial Road/A127 towards Basildon. After 6.6 miles, take the A176 exit towards Basildon/Billericay and keep left at the fork and merge onto Upper Mayne/A176. At the Asda Supercentre roundabout, take the 2nd exit and continue on Upper Mayne/A176. At the roundabout take the 1st exit onto Cranes Farm Road/A1235 then at the next roundabout take the 2nd exit and continue on Cranes Farm Road/A1235. You will then come to another roundabout with Festival Leisure Park on your left, where you need to take the 1st exit onto Festival Way. Continue on Festival Way, going straight over the first roundabout, towards David Lloyd Leisure. As you begin to pass Basildon Travelodge on your left, you need to make a right turn when possible on to Festival Business Park. The track is the first building ahead of you.